The grey-fronted green pigeon (Treron affinis) belongs to the family of doves and pigeons, the Columbidae. The grey-fronted green pigeon species is endemic to southern India. These species have been split from the pompadour green pigeon complex. These green pigeons are monotypic species. The grey-fronted green pigeon (Treron affinis) is comparatively a small green pigeon, measuring 25 to 30 cm in length. The grey-fronted green pigeon is characterized by whitish forehead. The crown is grayish. The hinderneck, upper back and underparts are pale green. The middle back and the wings are brownish red in male and are greenish in female. The rump and the short tail are greenish. The down-curved short bill is pale grayish blue with a darker base. The irises are pale blue. The legs are short and dark. The grey-fronted green pigeon call is a series of fluty whistling "keak..kee..oiee" sound. The grey-fronted green pigeon species is endemic to India and is distributed in the Western Ghats and the Eastern Ghats in peninsular India. It is distributed in the states of Gujarat, Maharashtra, Goa, Karnataka, Kerala, Tamil Nadu and Andhra Pradesh. These grey-fronted green pigeon species have high forest dependence. They normally occur in altitudes from 0 to 1500 meters. 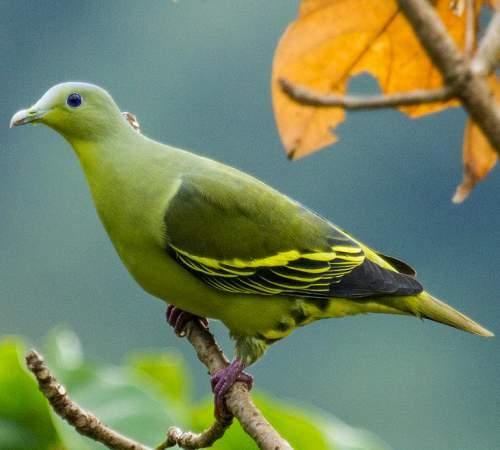 The natural ecosystems and habitats of these green pigeon species include, tropical and subtropical moist lowland forests, primary and secondary evergreen forests and primary and secondary moist deciduous forests. The diet of the grey-fronted green pigeon consists mainly of fruits. Wild fruits, berries, figs and drupes are their primary food. They usually forage on the branches of fruiting trees. They are also known to feed on termites. The breeding season of these grey-fronted green pigeon species is during December to March in most of its range. 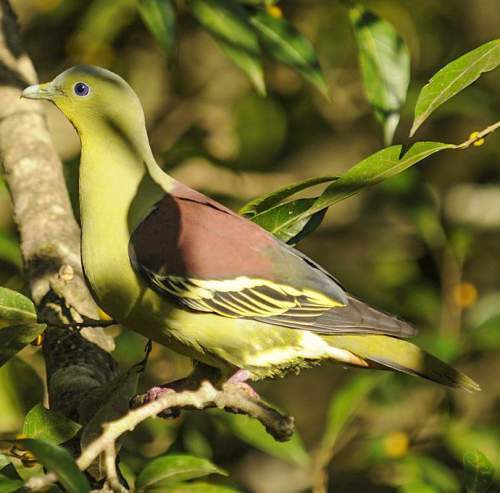 The breeding sites of these grey-fronted green pigeon species are located in trees in primary and secondary evergreen and moist deciduous forests. The nest is a flimsy platform of sticks and twigs built on the branches of trees, usually less than 4 meters above ground. These grey-fronted green pigeon species are monogamous. Both parents take part in the building of nest, incubation and care of young. The clutch usually contains two white eggs. The chicks hatch out in 12 to 14 days and are altricial. The grey-fronted green pigeon nestlings are initially fed with regurgitated crop-milk, a secretion from the lining of the crop of parent birds. Later the nestlings are fed with regurgitated fruits, seeds and plant matter. These grey-fronted green pigeon species are non-migrant resident birds. The birds in the higher altitudes descent to lower levels during winter. The global population size of the grey-fronted green pigeon (Treron affinis) has not been quantified. The overall population trend of the species is considered to be decreasing. In most of its range, this green pigeon species is reported to be common and locally abundant. The generation length is 4.2 years. Its distribution size is about 479,000 sq.km. Habitat alteration and destruction, deforestation, hunting, trapping for pet-trade and disturbance from human activities are the main threats that are endangering the survival of this green pigeon species. The grey-fronted green pigeon (Treron affinis) does not approach the thresholds for being Vulnerable either under the range size criterion, or under the population trend criterion or under the population size criterion. The CITES (Convention on International Trade in Endangered Species of Wild Fauna and Flora) status is ‘Not Evaluated’ for grey-fronted green pigeon (Treron affinis). The grey-fronted green pigeon (Treron affinis) is closely related to Sri Lanka green pigeon (Treron pompadora) and was previously considered conspecific with T. pompadora. Current topic in Birds of India: Grey-fronted green pigeon - Treron affinis.